Woolgatherings — Wayward Roots & Co. I was first introduced to Meghan Purcell, half of the wife-husband duo that makes up Purcell Trading, and her artistry through her participation in a collaborative photo shoot with a mutual friend. She had brought several of her felted wool hangings to have photographed during the shoot together. Having been exposed to fiber art in the past, I was astonished by the uniquely striking nature of her designs. They are multi-dimensional and complex with layers of wool and mountainous landscapes tracing across the surfaces. In contrast, the organic elements of the wool and neutral tones produce a calming and grounding response. Stunning would not sufficiently compliment the depth of her art. "To the revival of honest and simple." It is more than just a piece of Purcell Trading's mission statement, it is a life motto found in the corners of her home and studio where the walls are lined with items that carry a story all their own. It is equally prevalent in the ways in which she has been drawn to this work, a journey that can be found within our interview below. Let’s start at the beginning: Describe your journey to becoming Purcell Trading and the birth of your wool hangings. Purcell Trading started out as an opportunity with Jeff, my husband, to provide our art and hand picked antiques through an online shop. Since we met 11 years ago, we have shared a mutual love for antiques. There is so much to be said about the quality and care that went into making things back then. We wanted to create that same feel with our own products. It’s been our goal to make and promote a new generation of sustainable, handmade, heirloom quality art and wares. As it has evolved in recent months, his pottery and my wool art have emerged to the forefront of Purcell Trading. My wall hangings developed out of shear magnetism to the wool medium and a curiosity for the felting process. As a self-taught wool felter, it took quite some time (and a lot of ruined wool) until I understood what techniques worked for me. Eventually, a distinct design style developed and I have been making wall hangings since. Why did you choose wool as your medium? From the moment I saw the wool for the first time, I knew I was going to create with it. I was at the local farmer’s market and saw a farmer selling large bags of wool from white to grays and black. It was one of those undeniable moments in life when you don’t really know much about something, but you are as sure as ever that that thing will be a part of you. By and large, it’s the most responsible medium I’ve worked with. Wool is sustainable and completely natural. I know where it comes from; I have a face-to-face partnership with the farmers. The integrity of my work hinges on all these factors. Having studied art in college, I’m very acquainted with several different mediums but none have proved to be as ethically and environmentally responsible. This is important to me as an artist in our present time. The history of wool felting also fascinates me as it is thought to be the first form of textile. This ancient fiber process remains the same as it did thousands of years ago and I have the opportunity to pass this tradition along. More than ever, I think people are craving handmade, natural products in a world of machine-made, synthetic and unethically-produced materials. There’s such a look of satisfaction when someone touches a wall hanging. To my viewers, it’s not only a work of art, but a rich and natural tactile experience. I also attribute my interest in wool to the influence of the two predominant women of my youth. My great-grandmother helped raise me from the time I was born. Grammy always had knitting needles in her hand. For as long as I can remember, she was diagnosed as legally blind, but was so attuned to the technique that she didn’t need her full eyesight to know what she was doing. We were tremendously bonded. Grammy actually received the first kiss I ever gave and I gave her the last kiss that she ever received. She lived through the Great Depression, so it was understood that anything of a sensible purpose or benefit was not to go to waste. I don’t recall having more than one or two toys at her house, so I always found contentment in using whatever materials I could find to build or create with, including her yarn. This was the beginning of my life as an artist. Working with the wool medium often makes me feel connected to her in a reminiscent and even spiritual way. In addition to knitting and crocheting, my mother quilted and taught me how to make my own clothing. Under her guidance, I made my first quilt (for my cat) in 5th grade, and in my teens, my own prom dress. Since textiles and fiber have been a consistent part of my entire creative life, the wool medium came into my life very naturally. You source all of your materials locally. From working closely with a sheep ranch in Paradise Valley, whom provides the wool, to collecting the structures from the forests and mountains surrounding your home. Why is it important for you to maintain the approach of sourcing locally? In the digital age, there can be a lot of disconnect- from nature, to the goods we source, to actual, genuine human interaction. Jeff and I use any opportunity we can through Purcell Trading to develop partnerships within our community and take time to reconnect to the wilderness of Montana. Two guiding words we continuously come back to with our brand are “honest” and “simple”. We prefer to be self-sufficient or at least “cut out the middle man” in sourcing our materials. The wood that my work hangs from is sourced from the banks of the Yellowstone River. The tent that we use for markets was made from Lodge Poles that we carried out from the forest. My sheep rancher is just down valley, so I’m right there when they need help with a shearing or rounding up sheep to move to a different pasture. Through this time with the sheep, I am able directly give a “prayer” of thanks for their fiber. Everything I need to create with is right here where I live. These choices connect me deeper to what I think it means to be human; to work/create in a way that allows for individual (and even spiritual) growth while benefiting my community. The natural world has always been the biggest influence of my art’s subject matter, however, Montana’s landscape and spirit has completely rejuvenated me as an artist. The culture of Montana is one that allows us to slow down. I certainly didn’t move here to be too busy to enjoy the beauty and people it has to offer. Living in Montana has helped me to put a lot into perspective and to be more cognizant of how I spend this time I’m so fortunate to have here. I never want to look back on my life only to realize I never fully perused my art, the thing that really makes my spirit feel free and alive. I really appreciate any artist that can take an object and use it unorthodoxically; Joseph Cornell, Eva Hesse, and Joseph Beuys, to name a few. I’m inspired by antiquity, simplicity, and of course, nature. As a business owner in the digital age, you have the ability to reach potential customers all over the world. Why do you believe it is important to nurture and invest in your local community? In what ways have you and your work grown from the influence of a strong community? Although we do have an online shop that does extend outside of Montana, our general customer base is exclusive to local retailers in Livingston and neighboring city, Bozeman. It’s another opportunity through what I do to build meaningful connections. With every sale generated, that shop owner takes a portion, which benefits them and their families. Generally, the people that own a small business want to support other local small businesses, so the money is continually being circulated within the community. I think the “buy local” movement will continue to grow, as it’s a simple and effective way to help build a stronger community. It is something that’s becoming increasingly important to people. My work alone has grown tremendously through my community’s influence and support. I’ve had the opportunity to collaborate with a few other makers, which is always exciting to see the different directions my work can go. My studio is in an old former school that relies on grant writing and a board of directors to keep it updated and to keep rent reasonable for the artists. Fellow artists in the building came together to host a group art show over the summer that received so much community support- we had food donated from a local baker, beer donated from the local brewery, and live music from friends. Several art events like this one happen year-round. I am also able to give back through donating my work and proceeds from my work to local fundraisers and social justice coalitions. I’m proud to be a part of such a supportive and generous little community that continuously reminds me that we’re all in this together. 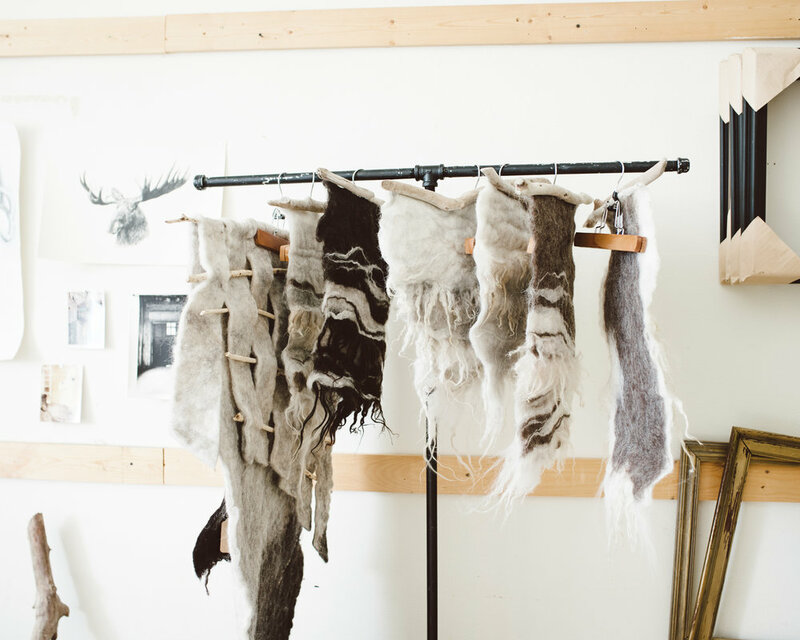 Describe your process for creating a wool hanging, beginning with inspiration to reaching the store front. The wool medium itself has been continually inspiring to work with. What heightens this inspiration is Paradise Valley, where I source the wool. There are a lot of artists in the West for a reason. We are continually inspired here. I like to bring my sketch book with me when I know I’ll have a moment to study the landscape. I like to take note of the changing shapes and shifting lines. I like to think about how my body and mind can feel so much ease in an often wild and unforgiving wilderness. I try to recreate that feeling along with literal gestures of subtle landscape. Often, I’ll work directly from my sketches of the places I’ve been so I can translate the unique feeling of a specific place into my work. With my inspiration, I go on a “wool run”, a 25 minute drive down valley to visit Barb and her husband, Per, who own and operate Wolf Ridge Icelandics, which is home to over 100 sheep. I buy in bulk and will return with about eight large bags or about 20 pounds of wool at a time. I work with raw wool (unprocessed, straight off the sheep) and wool that is skirted, washed, and combed. I begin by laying down several layers of wool. When I have my desired thickness, I begin manipulating the wool for the final layer to create my intended design. When it’s all laid out, I apply soap and water and begin agitating and applying pressure to the wool, front and back. Through this process, the fibers intertwine and irreversibly lock together. Then I rinse and hang it to dry. Once it’s dry, I tack it to found wood to be hung on the wall. Depending on the size, a single piece can take anywhere from 2-15 hours. I’ll reach out to the stores to see if they need a restock and then I deliver them. As so many people have felt, it’s a scary thing to launch into the business world without a lot of business experience. I have learned more than I thought I would along the way, including developing an artistic confidence. I remember my first couple solo art shows being absolutely terrifying. My hands were actually shaking. I like to think about how far I’ve come since then, through experience and forcing myself to be uncomfortable in order to grow personally and professionally. Although I don’t devoutly study or practice Buddhism, I came across a Buddhist message that talks about striving without attachment. It teaches that we should not be attached to the results of our activity because we cannot control it. Instead, we should be attached to why we’re doing it, those we are doing it for, and to the integrity of how we do it. We need to strive in a competitive world, but it should not be with greed, arrogance, or envy. I come back to this when I’ve had a setback, and it helps me refocus as a professional artist. In the end, it comes down to just being grateful that I even get to be an artist for a living. It’s such an enormous privilege. It has taken a couple years to evolve into what is now defined as my personal style. It is organic and often minimalist and simplistic. It’s modern, yet unrefined and natural. I pay a lot of attention to maintaining visual balance in a sea of wavering organic line, raw textures, and shape. Creating unity through a rhythmic arrangement of fiber color and contrast is another main focus. Since beginning Purcell Trading, what has been your greatest accomplishment? My greatest accomplishment, with inspiration from the aforementioned teaching, has been to maintain a love for my work without letting the money aspect of it guide all of my decisions. While I believe it’s important to make choices that don’t undersell myself and are good for maintaining a business, I don’t let my income be the only marker of my success. What are some of your goals/dreams for Purcell Trading? I dream of having a combination gallery space/Purcell Trading brick and mortar shop that also features the products of other intentional makers. Through this space we could also host workshops and events. I believe we were all born with the capacity and desire to be creative. I feel fortunate that creativity was nurtured during my youth and into early adulthood. It is an innate part of my being and I don’t feel whole when I’m not creating. Creating is an opportunity to foster positive social connection in an often divided and disconnected society. It’s my way of trying to make sense of the world and the human condition. I share my creativity to improve our collective relationship with each other and the natural world, and to promote responsible sourcing and sustainability.